For this week's gift guide, I've put together a selection of ideas for those important men in your life! 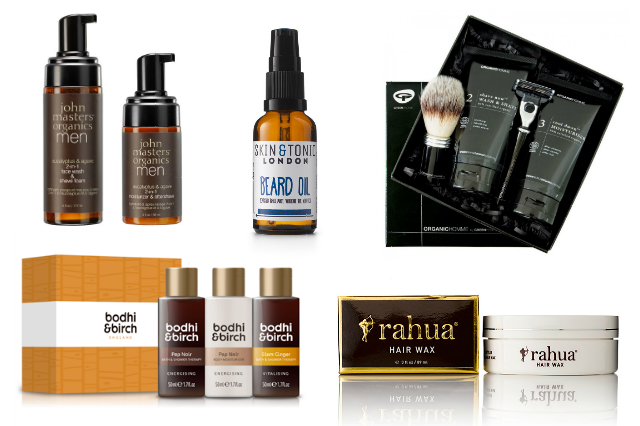 This little selection has the seal of approval from my other half and I think these are all gifts that most guys would appreciate, even if they're not already in to using green/natural products! There's a bit of a shaving theme going on with my first few suggestions, but I know a lot of the guys don't use that many products besides those for shaving so I figured it would be a safe bet! John Masters Organics are a well established brand in the natural beauty world, probably most well known for their haircare range, but there's also a few products in the skincare range that are specifically for men. These 2-in-1 shaving products are ideal for protecting against shaving irritation and soothing the skin. I'm sure you'll all probably know at least one guy who has a beard?! I never thought about men using products in their beards, but it does make total sense to take care of it, just like you use conditioner on your hair! This beard oil is certified organic by the Soil Association and can be used to help calm 'beard itch' or as a shaving oil. This set from Green People looks pretty great, containing a razor and shaving brush along with their Shave Now face wash/shave gel and Cool Down Moisturiser. I've seen a lot of positive reviews of the Organic Homme range so I think this would be a perfect gift for the man who likes a clean shave! All Bodhi & Birch products are designed to be unisex, but I think the warm, spicy Pep Noir scent and uplifting Siam Ginger scent might have the most appeal for men. This three piece gift set offers 50ml travel size bottles of the Pep Noir Shower Therapy, Body Moisturiser and Siam Ginger Shower Therapy which would be a perfect introduction to the brand or ideal for taking travelling over the holidays. It seems natural hair styling products like waxes and pomades are quite limited and tend to be on the pricier side of things! One that I hear does pretty well on the performance front is the Rahua Hair Wax. It's a creamy wax made with 100% natural ingredients and can be used on both short and longer hair for hold, sculpting and definition. Look out for stocking fillers and budget friendly gift ideas coming up next week! Great picks. Paul liked his Green People stuff but he used up his Therapi moisturiser so quickly haha. He just slathers it on way too much so I don't think he appreciates it much when I buy him skincare cause he just uses it all up without really thinking haha. He does love the Indie Lee Squalane Oil tho!